… is coming to Ottawa! Ottawa – Beginning in May, Ottawa will welcome 18 new and exciting food choices to the city’s streets. Following on the City’s commitment to promote small business opportunities in the local community, these new trucks and carts will increase street food vendor options for residents and tourists alike. Last fall, City Council approved the New Street Food Vending Program that provided for the opening of up to 20 spaces for new and diversified menus. A total of 61 applications were received and reviewed by a selection panel. These new options are in addition to the existing 44 licensed truck and cart food vendors. Wasi Choudhry: Olive Green – The South Asian food experience – location to be confirmed. My low sodium diet will prevent me from partaking of these pavement treats very often, but it is nice to see Ottawa’s street food scene change with the times and offer more than just fries, hot dogs and sausages. I guess this guy didn’t apply. 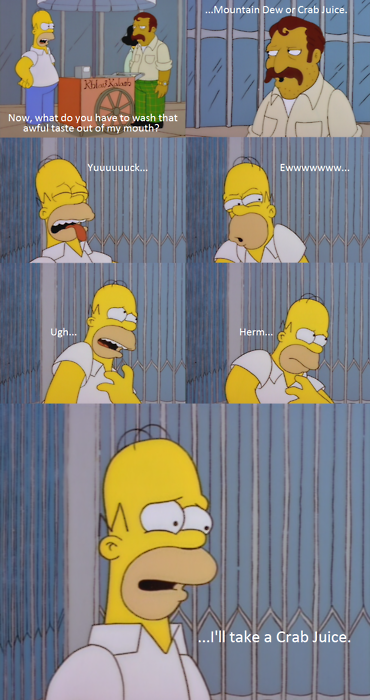 h/t to seealsoregret for the Simpsons montage.